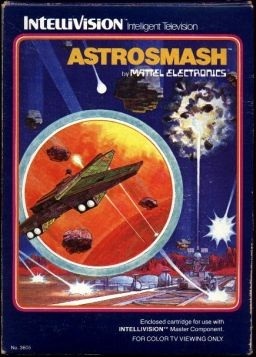 Astrosmash is a video game for the Intellivision videogame console written by John Sohl and published by Mattel in 1981. In this game, the player controls a laser cannon protecting the earth from falling asteroids and other threats. It sold over 1 million copies and replaced Las Vegas Poker & Blackjack as the Intellivision's pack-in game. The Intellivision games catalog gives the following description of Astrosmash: "Spin. Blast. And drop into hyperspace to avoid a killer asteroid shower. Power on. Attack computer engaged. Fire a quick burst at the alien antagonists. Got 'em!" Astrosmash was conceived as Avalanche! after Meteor! did not take up the cartridge's entire ROM space. Meteor!, an Asteroids clone, was cancelled to avoid a lawsuit and Avalanche! was released as Astrosmash. The resultant game borrows elements from Asteroids and Space Invaders. Astrosmash is like many space-shooter games of its era and involves shooting bombs, asteroids, missiles and flying saucers. It is somewhat similar to the game Asteroids in that most of the target objects are rocks that break apart into smaller pieces when shot, and the player can enter "hyperspace" as an evasive maneuver and be transported to a random position on the screen; however, the player's cannon is more akin to that in Space Invaders as it is situated on a planetary surface and thus can only move from side to side. The object of the game is straightforward; objects fall from the sky at increasingly fast speeds and the player must shoot them before they hit their cannon. Note: The objects below will cause the player to lose a life when hitting the player. Asteroids: The most numerous object in the game, asteroids come in many different colors and at differing speeds (starting off at slow speeds, then progressively falling faster). They come in two sizes. Shooting a smaller asteroid completely destroys it while shooting a larger asteroid often causes it to split into two small ones. If an asteroid hits the ground, the player loses 1/2 its point value. Spinners: White spinning objects that make a whistling sound as they fall. They come in two sizes and can cause the player to lose a life by both hitting the player or the ground. Homing Missiles: Homing missiles fly down from the sky and move towards the player. They only come in one size and appear as a light, similar to a falling star. When they appear, they make a beeping noise. Only one can appear on the screen at any given time but they may appear in rapid succession. They have a tendency to follow the player even if he warps away, sometimes even hovering in a horizontal line over the ground, which makes them impossible to hit (though at other times they will continue falling to the ground). They will be destroyed if they collide with another object, though no points will be awarded. They have no effect or point loss if they hit the ground. UFO: Appears after the player has accumulated 20,000 points. They float across the screen rapidly firing missiles at the player. A missile hit causes the player to be killed. While incoming missiles may be destroyed, they are worth no points.